Making pizzas at home is absolutely fun and delicious. Once you get the hang of it you’ll be doing it all the time. I thought this would be the most fun thing to do for demonstrating Yeast for the letter Y. I bang out a cool Margherita on the show as well as a walnut, pear, arugula, blue cheese number. Awesome. We are damn near the end of the alphabet and on the letter Y. Again, now a lot of foodstuffs to choose from so I thought it’d be cool to feature YEAST on this episode. I think Yeast is amazing stuff and we really take it for granted. It’s in nearly all the bread we eat, a whole lot of the alcoholic drinks out there (beer and wine mostly) and truth be told it is all around us, all the time. This is a cooking show and so I will not focus on the nasty, pathogenic strains of yeast that can cause infections and illness. No, today it’s all about the healthy happy yeast floating all around us, resting on the skins of our fruits (especially grapes and apples) and veggies and ready to do good. And then there’s the yeasts you can buy at the store for baking or the nutritional yeast (brewer’s yeast) for eating—great stuff and pure protein! I got an appreciation for yeast early on when I was in high school and my brother and father started to do a lot of home brewing. There were different strains of yeast involved in their alchemy and I still remember the unusual scent of the stuff in our kitchen. A couple years back I was working as an apprentice winemaker at Peay Vineyards on the Sonoma Coast in California. It was there that I learned the power of natural fermentation, which we relied on to ferment our grapes and turn that sweet, sweet juice into glorious wine. There was enough precious yeast stuck to the skins of our grapes to begin fermentation totally naturally—a really remarkable feat! After a couple days the crushed grapes would jump in temperature and start to foam as the yeast ate the sugar and burped out CO2 and alcohol. Occasionally I’d have to kickstart the process with a small yeast (or yeast husk) addition to a tank of macerating grapes, I’d stink like yeast for the rest of the day. The packages fascinated me though, different strains from France that were meant for different types of wine (Grenache, Syrah, etc.) and each one had a distinctive, unusual, fruity, musky scent. It was also in Sonoma that I fell in love with an outstanding sourdough bakery named the Wildflour Bakery in Freestone. These guys use a sourdough starter that is over 15 years old and creates the most amazingly delicious breads in the world. I was blessed and honored to receive a piece of their starter which I have been lovingly tending for the past year and half, I named it Omar. But you don’t need a bubbly sticky mess of starter or exotic imported Grenache yeast to get down in your kitchen. Every grocery store sells packets of yeast and if you’ve never made anything with it, shame on you! So let’s get crackin’! Pizza it is on tap for the mighty yeast episode. I have never, ever understood why anyone buys pizza kits, frozen pizzas or orders delivery. It makes no sense to me. 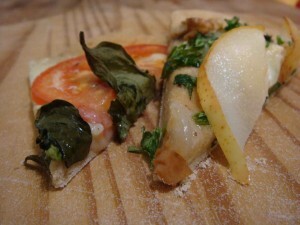 You can make your own pizza in no time flat with your own fixings. I always make extra dough and par-bake a bunch of crusts to store in Ziplocs in the freezer. Voila! I have killer, ready-to-eat pizzas any time. With a salad, you can’t ask for a better lunch or quick dinner. Oh yeah, did I mention that it literally costs pennies to make pizza dough? Totally. On the show I rock out a pear pizza. Originally I did a more traditional margarheita too, but we cut that out of the edit and left in the more funk-a-fied offerig. I love to make alternative pies and this one is a great one! When it comes to yeast, there are health benefits. You know it. I’ve been making pizza at home for years. In fact, I can’t even remember the last time I bought a frozen pizza or ordered take-out. Sure, occasionally I’ll go out for pizza too, I can’t help it…it’s everyone’s favorite food after all! But making your own pizza from scratch is the best—really entertaining and delicious. It’s also a great way to turn a casual dinner party into a killer shindig. The key to a good pizza is the crust, so here are a few things about making bread to get you started. It’s pretty simple but still requires a bit of practice, so don’t be bummed out if your first attempt isn’t perfect–there’s no such thing. My pies are never uniform or round and they’re always a little bit different each time. Only practice will let you get the feel for what you like because so much in this type of baking is tactile. It requires you to get your hands in there and touch the dough. If it is wet and sticking to your hands or the work surface, you’ll need more flour. This recipe isn’t exact, and I’m one of the guys who always says baking generally requires precision. It’s like a science. But making bread is different. The type of flour you use and the humidity of your kitchen will make a difference. I recommend having an extra 1/2 cup of flour at your immediate disposal for the kneading. You might need more or it’s possible that you might need less. On the show I was using all purpose whole wheat flour but I think it’s easiest to start off using all purpose white flour if you are a first timer. Another thing that really helps me out is the use of a pizza stone. Rather than spending cash and buying one, I hit my local hardware store and made my own. Unglazed quarry tiles are what you are looking for–something with no lead or dye in it. I’ve used Saltillo tiles and think they work really well, but they tend to crack easily. Whether you invest in a stone or go for quarry tiles, you want to have a flat surface to cook your pies on. Using the racks in the oven isn’t always a great idea, so if I don’t have a stone I usually invert a sheet pan (or use a cookie sheet) and place it on the racks. To slide your pizza on and off its flat cooking surface, you’ll want to invest in a pizza peel–my “paddle” from the video. It’ll help you slide the dough on and off. Using another inverted sheet pan works as a great substitute. Enjoy the process. Have fun with this recipe, it’s just pizza in the end! Preheat your oven to 450° Fahrenheit for at least 30 minutes prior to baking. The first thing we’re going to do is proof the yeast, especially when you’re not sure of the age of your yeast. Place the yeast in a bowl and pour warm water on top. Add a tsp of honey to the mixture. I use my fingers for the mixing by rubbing the granules of yeast until they dissolve. Let this sit for ten minutes. If the yeast is alive and active, you’ll get a foamy, bubbly looking surface. If nothing happens, the yeast is dead and you’ll need some new yeast. If you know that you’ve got good yeast, there’s no need to proof it. Skip the honey and water trick and just add the dry yeast directly into your flour and salt. If you’ve proofed the yeast in water, go ahead and add the wet yeasty water to a bowl and add the flour in 3 or 4 stages by combining with your hands as you go. When all of the flour is incorporated add the salt and olive oil. Bring it all together and get ready to work it. Spread a little flour on a flat work surface. I use a slab of marble. Then gather up your dough. Push on the dough with the heel of your palm and get a nice rhythm going. Knead it for five minutes, adding flour as you go to keep it from sticking to your hands or the work surface. After five minutes you’ll need to let the dough rest for a good 1 to 2 hours. Dust the ball of dough with flour or rub it with some olive oil. Then put it in a bowl, cover the bowl with plastic wrap, and drop a lightly dampened tea towel on top. Put the bowl in a warm, draft free place and let it sit for at least an hour. It will more than double in size. Punch the dough down to deflate it. Then cut it in half. Flour your pizza peel or sheet pan and start flattening and pressing the dough into your desired shape. You can use a rolling pin for this, but I prefer to use my hands and fingers because they give the pie more texture. I usually go for some sort of amoeba shaped pizza myself, but occasionally I’ll go rectangular. When you’ve got the shape you want, drizzle on a little olive oil and top with your favorite ingredients. Less is more is my motto when it comes to pizzas, so don’t go crazy. 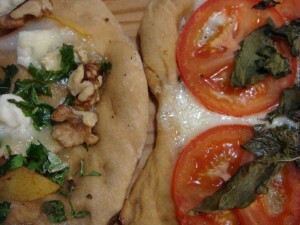 On the show I did a pizza with fresh pears, arugula, goat cheese, blue cheese, and walnuts. I also made a Margherita of mozzarella, fresh tomatoes, and fresh basil. One classic and one funky, but both are amazing. Slide the pie on the stone in the oven. If you’re not using a stone, you can just pop in the sheet pan. Definitely check the pie after 7 minutes, but it will probably need about 10 to be fully done. Cook until the crust is golden brown and the cheese is bubbly. Cut it up, let it cool, and dive in. X is for EGGS or EGGS are for X. Either way, it’s the letter X and on this video I bang out an incredible Indian Masala Frittata and talk all about the incredible edible X! How excellent! X stumped us all. Once again, a play on words was needed to tackle this egg-cellent letter. EGGS it is! Do I have to say anything about eggs? Yes, I do. You know I have a lot of issues when it comes to chickens and the same goes with eggs. I’m on the hunt for a humane, happy and tasty product. Conventional eggs have so many different labels on them, I can’t keep track and I’m never really sure if those birds are free range or humanely raised or what. One day it occurred to me, THEY SELL EGGS AT THE FARMER’S MARKET…the only place I feel really comfortable buying chickens from. Now that I’ve gone down that path, I’ll never go back. The taste alone blew my palate and my mind! I was shocked, totally, full on, flat out, caught with my pants down, surprised and amazed when I tasted my first farmer’s market egg. It was like a whole new food. Ever been to a really expensive brunch and had an egg that was super tasty, rich and creamy? That’s what I’m talking about. You can have that egg every day if you’d get them from the source. When you get eggs from the Farmer’s Market you might be surprised. They’re not all the same shape and they’re not all the same color. 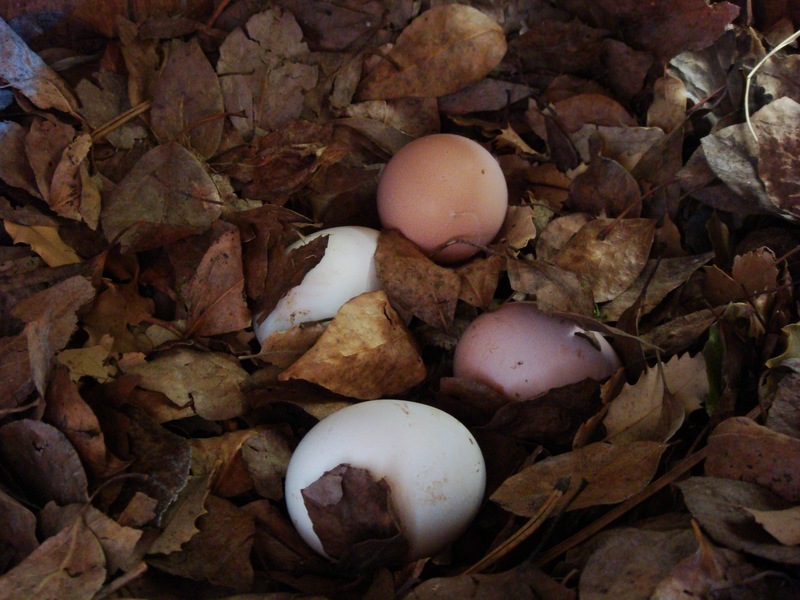 My dozens are mixed; a few round and small eggs, a few long and big ones and the colors are all over the place– beautiful with blue, green, brown, speckled and light grey shells. The camera didn’t pick up the hues in the colors very well, but my eggs on this episode were indeed multi-colored and the yolks were really rich, almost orange in color. In case you were wondering, the color of the shells has no effect on the flavor, nor are there any changes in the nutrition. Different breeds of hens lay different colored eggs. The good outweighs the bad. For a long time people were freaking out about eggs, saying they had too much cholesterol and too much fat to be in a healthy diet. But what about all that protein and the multitude of vitamins and beta-carotene? Eggs are good for the eyes, the skin, the brain, the heart; they help you stay positive and happy. And they’re fun to cook! Almost every chef I know loves to throw down on some eggs, turning out the perfect omelette, poaching, frying, soufflé-ing…it’s a miracle food. They are in so many sauces and custards, ice creams and baked goods; even all by themselves they are fantastic. Traditionally, a restaurant will test out a new chef by asking them to prepare their favorite egg dish. It’s amazing how one simple ingredient can be used in so many different ways to create so many tasty things. For me, nothing tastes better than farm fresh eggs whipped up and cooked into a perfect French rolled omelette. I don’t need anything to flavor the babies, just a little butter and sea salt. Voila! It was bigger, bolder flavors that really attracted me to eggs at first, especially since I never really liked eggs that much growing up. But in 2000 I was in Rajasthan India and ate my first masala omelette. It really grabbed my attention and thus, I turned it into the frittata for episode X. Which came first, the chicken or the egg? I can’t get into this debate. But I know that nothing tastes better than humanely raised, organic, farm-fresh eggs. So get down to your farmer’s market and get some of those fun and funky, multi-colored, delicious and excellent eggs!